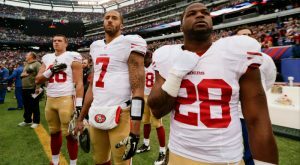 You are here: Home / News / Colin Kaepernick’s Sit-Down Aside –The Case for Standing for the National Anthem. He showed guts in telling the world that he would not stand because of continued police abuse and killing of blacks. He plays in the most rigid, quasi-military, my way or the highway, pro sport run by some of the most conservative rich white guys on the planet; most with solid and deep GOP ties. He potentially could lose millions in contract money and endorsements now or down the line for his personal sit down. So yes, he should be loudly applauded for having the courage of his convictions and for showing the world that there is some big name, big payday, pro athletes who are willing to speak out and take stands on controversial issues even at the cost of their jobs. The firestorm that he stirred up for that is way out of proportion to his action since there are 1700 players on the 32 team roster in the NFL and even with Kaepernick sitting during the anthem that still leaves 1699 or so players who will stand at rigid attention during the playing of the anthem. But Kap’s actions aside, the script can easily be flipped and a case can be made for the millions of blacks who do gladly stand for the national anthem. Most know the brutal history of racial violence, exclusion, and poverty that trapped and still traps countless numbers of blacks. They watch and read almost daily of the police killings of mostly unarmed blacks, the mass incarceration numbers for blacks, the grim figures on job and housing discrimination, the gaping health care disparities, and the endless other big and small racial insults and indignities. The symbol of that is the flag that they are asked to stand at rapt attention to with their hand over their heart. But, they also know that tens of thousands of blacks answered the call to fight for that same flag and anthem in every major war the U.S. has ever fought, and despite the violence and discrimination black servicemen and women suffered, they still served their country honorably and wore the uniform proudly. They know that civil rights leaders from W.E.B. DuBois to Martin Luther King, Jr. carried the flag and sang “My Country tis of thee” at and during countless civil rights marches. They know that the landmark victories against racial oppression—the passage of three major civil rights bills, the Voting Rights Act, and legions of other civil rights initiatives and legislation passed by states and nationally were won under the banner of fulfilling the promise of American rights and liberties that the flag and the national anthem represent in theory, if not always in fact. It was their struggle to make the promise of freedom a reality for blacks and others victimized by racial injustice and violence. Blacks also know that despite the towering racial barrier and obstacles that the Constitution still stands as a powerful shield to protect the rights of all Americans, and for black Americans to continually use as a weapon to shame, embarrass, and cajole the nation to extend those rights and liberties to them too. Finally, they know that blacks have paid with their blood and earned the right to lay as much, if not more, claim to the flag and the national anthem as those among the most rabid flag waving, phony super patriot bellowing crowd. This is their America, always has been, and it’s their flag and national anthem too, whether they choose to stand when it’s played or not.